Developed to offer a gorgeous fit, this Flounce swimsuit top consists of sliding full-coverage cups that are collected below the bust. Retro swimsuit will make you regain confidence and fabulously reveal your curves. Removable padded deals extra protection and enhance your shape. Adjustable straps use comfortable support and subtle lift. For best results, rinse and line dry right away after use. Question: Is the size run little? Response: No. Various body shapes ought to select the size of swimsuit fiting your body design. Response: No. Just detachable padded. Question: Does the bottom translucent? Response: No, the front and back of the bottom are made with lining. Question: Does the size large size? Response: No, this is regular size, not large size swimsuit. 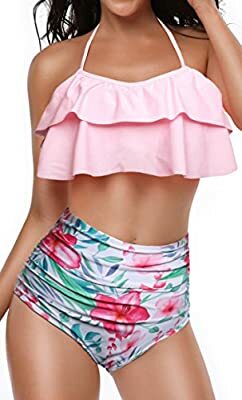 Response: Yes, the adjustable straps use a little support for bust, but this swimsuit is not ideal for heavy bust females. Material: 82% Nylon, 18% Spandex. Dear customers, please note that HEAT MOVE has registered a US brand and we don't authorize any seller to use our brand. Purchases of goods sold by other sellers will receive empty package or poor quality products; returns, refunds and other services are not guaranteed. Please order item sold by Heat Move ,Thank you. Designed?Ruched double ruffled flounce, adjustable ties at neck and back,Removable Push up Padded Bikini Top,printed bottoms,bottom with lining non see through Classic coverage: Falbala top swimwear matches with printed bottoms,Retro swimwear will make you regain confidence and fabulously show your curves. Best choice for summer beach,swimming pool,SPA,Solarium, unique design Please Refer To Our Detailed Size Chart below the product description Before You Purchase.